Have a specific question about a Mega Slam Hoop product, delivery or installation? Find the answer here in our most frequently asked questions. If you can’t find the answer you’re looking for, we’re always here to help. Just Contact Us. How do I install my Mega Slam? You can install your own Mega Slam hoop or find a professional installer to help you. The back boards and basketball systems are quite heavy, so if you’re up for the challenge of installing it yourself, make sure you have some friends along to help you get the job done. Learn more about installing a Mega Slam Hoop. Where can I find an installer to assemble my Mega Slam Hoop? If you’re looking for a trusted and professional installer for your Mega Slam Hoop, search our local installer-database. Find an installer. We are endorsed by the United Assemblers Network (UAN) as a quality product and work with their Network of experienced and trusted installers when we can. What if I want to paint lines onto my court? We offer a stencil kit that makes this process easier. You can purchase the stencil kit on our Accessories Page. How much does installation typically cost? Prices for installing typically range from $375 - $650, depending on your location and the specifics of your yard & setup. Keep in mind, the multiple-step installation process requires a couple home visits for any installer. Exact installation pricing can only be quoted by the installer as they are all independent contractors. How long does it take to install a Mega Slam Hoop? Whether you’re installing it yourself or having it done professionally, it’s a two-phase process. Phase one is approximately 90 minutes to install the anchor foundation for your Mega Slam Hoop. The concrete needs to cure for 72 hours prior to system assembly. For phase two of the assembly, it takes about 90 minutes to assemble and raise a Mega Slam Hoop. How many people does it take to install a Mega Slam Hoop? For free-standing, in-ground systems, one (1) to two (2) adults are good for installing the concrete anchor that holds your system. Four (4) adults are recommended for installing the basketball system on top of the anchor. The ½-thick glass backboards weigh a lot, and requires a lot of strength to lift and then to adhere to the system. Refer to your manual for detailed instructions. How are free-standing Mega Slam Hoops anchored to the ground? All of our in-ground goals utilize a J-bolt anchoring system with self leveling nuts. This method let’s you to adjust the anchor after the concrete has cured to insure an always-level hoop, and also makes it easy to take your Mega Slam Hoop with you to another home. Watch how to make a concrete base and install the anchor for your basketball goal. 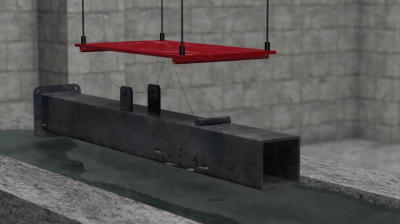 What size hole needs to be created for my in-ground anchor system? Depending on your in-ground model, there are slightly different sized holes that need to be dug and filled with concrete. Refer to your manual for specifics. For your safety, always call 811 before digging to avoid hitting any in-ground gas pipes or power lines. WIll I need a forklift or mechanical lift to install my FX® in-ground hoop? No. We’ve engineered an easier way to completely install your FX® in-ground hoop without the need for a mechanical lift. The Mega Slam® Hinge Assist feature allows for complete installation of your FX® in-ground basketball system while the backboard stays on the ground. The basketball system can then be hinged as one unit, tilted upward and then locked into place. Refer to your specific manual for detailed instructions. How far back should I set my basketball goal from the driveway? It is typical to set the anchor concrete flush with the driveway, or up to 2 feet back from the driveway edge, depending on how much space is available in your playing area. Our in-ground systems have various overhang lengths ranging from 3-feet to 5-feet. “Overhang” is the distance from the front of the main pole to the front of the backboard. View court specifications for an NBA, NCAA or high-school basketball court. How much clearance behind an in-ground basketball system do I need? It is optimal to create a full 24 inches of space behind the post of our adjustable in-ground basketball systems to allow use of the height adjustment handle. How long should I wait until playing on my new Mega Slam Hoop after installation? Once your new Mega Slam Hoop is installed according to our detailed installation instructions, it’s Game On! Can I take my Mega Slam Hoop with me when I move? Absolutely. The in-ground basketball system is anchored by (4) threaded J-bolts installed next to your driveway or on your backyard basketball court. Simply install another anchor system at your new location and re-install your Mega Slam Hoop. You can purchase a new anchor kit from our website on our Parts Page. What are the court dimensions of NBA, NCAA, and high school courts? The various size dimensions can be found on our Court Dimensions page. How do I maintain my Mega Slam Hoop? (1) Keep any organic materials (grass clippings, garbage, etc.) away from the steel pole or base plate to prevent any rust penetrating the powder-coat finish. (2) Clean the backboard periodically with water or a household glass cleaner and use a soft cotton cloth or paper towels. (3) If you see any signs of rust on the system just remove the loose paint, gently sand the area, and apply outdoor enamel gloss paint to the affected area. What makes Mega Slam Hoops the best? Mega Slam Hoops builds the highest-quality residential basketball systems in the world. We incorporate superior materials and advanced engineering techniques to deliver a product that will stand the test of time. From bolt to basket, here's what goes into Mega Slam Hoops superior quality and design. What is Directional Flex® Technology on the 180 Pro Rim®? Directional Flex® Technology allows our 180° Pro Rim to flex in any direction away from the backboard. This feature is safer for players who dunk and provides the breakaway action seen on professional rims. What’s the difference between the Collegiate Flex® Rim and the 180 Pro Rim®? The 180 Pro Rim® flexes any direction in a full 180° from the backboard using our Directional Flex® Technology. The Collegiate Flex® Rim flexes only front to back using a Single Pivot® movement. Can I use both the Game Light® and Net Protect® together? Yes. The Game Light® and Net Protect® are made to work together on the same free-standing system. Both accessories can fit any free-standing Mega Slam and FX® system, or any other brand hoop with a main pole that measures 12"x8", 8"x6", 6"x6", or 5"x5". Just choose which system you have and we’ll make sure you get the right-fitting accessories. What basketball systems does the Game Light® work with? The Game Light® works with all free-standing Mega Slam® and FX® systems, with a main pole that measures 12"x8", 8"x6", 6"x6", or 5"x5". Choose your system and get the right Game Light® when you visit the product page. What models does the Net Protect® work with? The Net Protect® works with all free-standing Mega Slam and FX® systems, with a main pole that measures 12"x8", 8"x6", 6"x6", or 5"x5". Choose your system and get the right Net Protect® when you visit the product page. What does the No-Break Backboard Protection™ plan cover? The No-Break Backboard Protection™ plan is a replacement program where Mega Slam Hoops will replace your broken backboard one time free-of-charge. The purchase must be directly from megaslamhoops.com for residential usage applications. Read more about No-Break Backboard Protection. How do I determine which system is best for me? To determine the best system for all your needs depends on the size of your playing area and your budget. Since we design all our products to last a lifetime, you might also consider an adjustable-height model like the MegaSlam to grow with your friends and family over time. Our Hoop Finder can help you find the right basketball system. What’s included free when I order a Mega Slam Hoop? When you order a Mega Slam Hoop, you will receive free rust-resistant galvanization, custom-fitted pole padding, gusset padding, backboard padding, anchor kit, free shipping, and a limited lifetime warranty. Our competition can’t say they include the same. Where can I buy a Mega Slam Hoop? You can buy any Mega Slam Hoop directly online. We are a direct-to-consumer business, which cuts out retail stores as the middleman, so we can offer you a superior product at a more-competitive price. If you are outside Texas, there is no sales tax. Can your basketball systems withstand all seasons and weather conditions? Yes, we have engineered our systems to be as weather-resistant as possible. Our in-ground systems are hot-dip galvanized, which makes the rust protection 10-15 times thicker and more rust-resistant than the competition. We also powder coat all the steel for our final layer of corrosion protection. We also provide stainless steel hardware to prevent rusty nuts and bolts. What is the overhang measurement on a Mega Slam Hoop? Overhang is the measured distance from the front of the main pole (or wall plate) to the front of the backboard. Depending on which model you select, Mega Slam Hoops offers an overhang distance ranging from 3-feet to 5-feet. Regulation overhang is 4-feet. Many players prefer a 5-foot overhang to give some distance from the main pole to the base line. What is the adjustable height range on the MegaSlam in-ground basketball systems? Our Mega Slam adjustable basketball systems are made for all ages and skill levels. The height range can be adjusted anywhere from 5-feet to 10-feet and varies by model. See a comparison of our MegaSlam basketball systems. What does the lift assist do on a MegaSlam adjustable basketball system? The Mega Slam lift assist helps to effortlessly raise and lower your adjustable Mega Slam Hoop. It’s a spring-loaded cartridge that help neutralize the heavy weight of the backboard. This spring loaded cartridge comes pre-assembled. How do I secure or prevent anyone from changing the height on my MegaSlam adjustable-height hoop? You can remove the adjustment handle on all of our Mega Slam adjustable, in-ground basketball systems to prevent height adjustment. A clip holds the handle in place and can be easily removed. For maximum security, you can purchase our Actuator Security Cover® that prevents tampering with the actuator while the handle is removed. See the Accessory page for the Actuator Security Cover. What is the stop pin for on a MegaSlam adjustable height basketball system? The stop pin prevents smaller children from lowering the rim to unsafe heights that could possibly collide with vehicles in the driveway. When the stop pin is inserted, the system can only be lowered to a height of 7.5 feet. Take the stop pin out, and the system can be lowered to 5 feet for smaller children to play. What if I want to make my home court to be the same as an NBA or NCAA regulation-sized court? We have specifications for an NBA, NCAA or High School regulation courts available if you want your home court to resemble those court experiences. We also sell a stencil kit to assist with painting lines on your court. View the court stencil kit. My card payment was not processed and did not go through, what should I do? If your debit or credit card payment did not process, there are a variety of reasons why that could be. Here’s some steps to try and help your payment go through. For a debit or credit card purchase, please re-check the payment details you submitted and make sure they are correct and re-submit your payment. Your credit card company or bank may be preventing the purchase due to fraud protection or set spending limits. Call your bank or credit card company and then repurchase the item. When you order from Mega Slam Hoops, you don't have to worry about paying outrageous shipping fees. 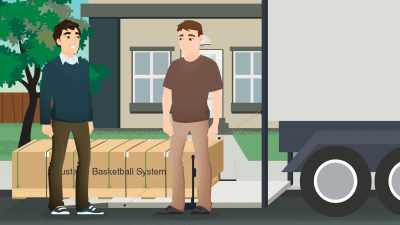 Our shipping is free and we deliver your hoop direct-to-curb, which means it comes directly from our warehouse, off the truck and to your curb so you waste no time getting to those free throws. Ask other hoop makes if they do the same! Remember that our delivery date is only an estimate, when your shipment gets to your local terminal, expect to get a phone call from a shipping specialist to arrange your specific delivery date and time. This is also a good time to coordinate with an installer if you're planning on hiring one. Watch our shipping video, then use our 5-point check list to ensure a smooth delivery of your Mega Slam Hoop. Mega Slam Hoops ships free within the continental US by appointment. Here’s how it works. Is the shipment of my new Mega Slam Hoop insured? Yes. Your new Mega Slam Hoop is fully insured from the minute you order it up until you sign the shipping ticket. Yes, a signature is required for delivery. Once you sign the shipping ticket the shipping company is fully released of any liability. Make sure to thoroughly inspect the products and indicate any damage before signing the shipping ticket. How long does it take to receive my new Mega Slam Hoop? Typical delivery time is 2-6 business days to anywhere in the continental US. The delivery time varies depending on the distance of your location from our warehouse. Secondly, all residential deliveries are done by appointment. If you are tracking your order online, it will only show an "estimated" delivery date until an appointment is made. We cannot guarantee a specific delivery date, as sometimes delays occur in transit. Therefore, it is advised to order in advance of your anticipated installation date. Does Mega Slam Hoops offer expedited shipping? Unfortunately, no. We currently do not offer expedited shipping for our basketball systems. The systems are heavy and ship by ground transportation. Can I have the anchor kit shipped separately in advance of my system? Your anchor kit is inside the main pole box, and cannot ship separately. However, if you want to get an anchor kit shipped separately, you can purchase an anchor kit on our Parts Page. You will still receive an anchor kit with the purchase of a complete system. The standard shipping is by ground. However, if you need this shipped next day air please email us your zip code and specific part for a shipping quote. Once your order is processed, Mega Slam Hoops will email you a detailed receipt for your order. In addition, you will receive a separate email once your order ships with all necessary tracking information that can be processed on the freight company’s website. Our basketball systems are built to last a lifetime. If a box or pallet is damaged it doesn’t necessarily mean the basketball system inside is also damaged. Fully inspect the shipment and make note of any damage on the shipping ticket before you sign. If you find a damaged piece, list the details of damage on the delivery receipt at time of delivery. Contact Mega Slam Hoops immediately by emailing us photos of the damaged parts to support@megaslamhoops.com. We cannot ship replacement parts without photos of damage.